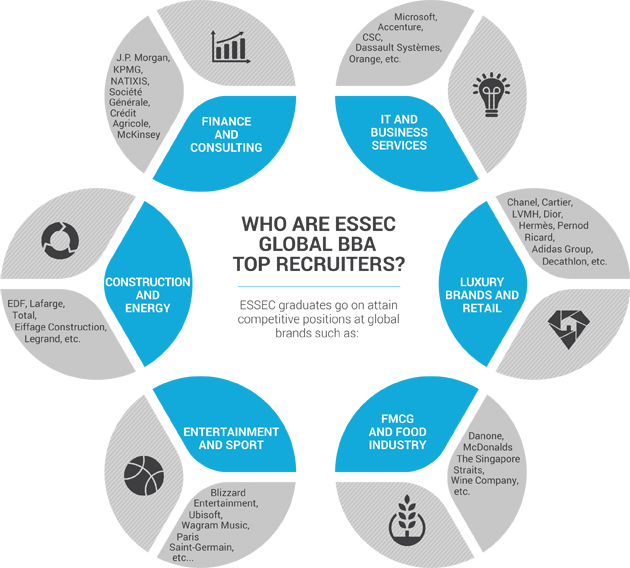 You can choose whether to start the program at our ESSEC France campus, the ESSEC Asia-Pacific campus (Singapore), or the ESSEC Africa-Atlantic campus (Morocco). Become truly multilingual by learning 3 languages: French and English are compulsory foreign languages for non-native speakers. At the end of the 1st year, students from each school can apply to be part of the program and only ten students from each are selected. Students admitted in the IBEA-track that started in Singapore or Morocco can choose to do their first semester of the second year in both France and Singapore. The second semester of the second year will be back at the campus where they started. At the end of the 2nd year, admitted students will spend one semester at each of our partner schools. This is the perfect opportunity to spend time at some of the most prestigious business schools around the world, meet and interact with people from all different backgrounds and nationalities, study in several environments and by the time you obtain your degree, you will have the truly international profile sought after by employers. Whichever campus you choose to begin your studies, all students now, except students in the IBEA track, come together to choose to continue the program in one of three tracks, all of which focus on providing you with opportunities for more international exposure and professional experience. The good news is that you are not limited to 1 or 2 possibilities for your exchange but potentially have to choose from the 150+ Global BBA partners. Whatever your personal interests and links, whatever your future career goals, you are sure to find the right exchange for you! A transition from the first to the second half of your studies.Formerly known as iXperience week, the iMagination week welcomes students from Singapore, Morocco and Mauritius to the Cergy campus at the beginning of the third year. In this introduction week, our international students learn about our campus in France and are encouraged to blend in, to develop, and to think outside the box. The ESSEC Global BBA has an international exchange network of 161 partner universities in 44 different countries across 5 continents so you are sure to find what you are looking for! ESSEC Ventures and Antropia business incubators on the French campuses house start-ups and provide support in terms of coaching and resources. France/Morocco Campus: tuition fee is 12,500 EUR per year. Singapore Campus: tuition fee is 20,500 SGD per year.